The Batter Thickens: Peanut Butter "Waffles"
Warning: this post contains a heart-wrenching tale of woe and hardship, to be overcome by a brilliant, tough and hard-working, problem-solving protagonist. If you easily get emotional during stories, I recommend grabbing a box of tissues right now. Once upon a time, there a young girl, who shall be referred to as Little Girl. One day, her dad went on a trip for two weeks and the morning he came back, she wanted to make him some waffles for breakfast when he woke up. But it was a school day and she had never used her waffle maker, so making it for her Dad did not work. She ended up making him some delicious cupcakes instead. The morning finally arrived that she could make her waffles, so she set to work making the batter. She had a feeling in the pit of her stomach that something might be wrong with it, because the batter was not the consistency of hotel waffle batter, but she dug out her grandmother's old waffle maker that had been used in who-knows-how-long. It was sticky and needed a deep cleaning, so she gave it a deep cleaning before pluggin it in and waiting for it to heat up. A MESS! It had stuck to both sides and crumbled all over the place, despite the grease. She sighed and unplugged the pan and let it cool before scraping down the entire pan onto a plate. Now, remember when I told you at the beginning of this story that it was about a "tough and hard-working, problem-solving protagonist"? Well, she used her brilliance and remembered her gut feeling and tried putting the batter on the stove to make a pancake. 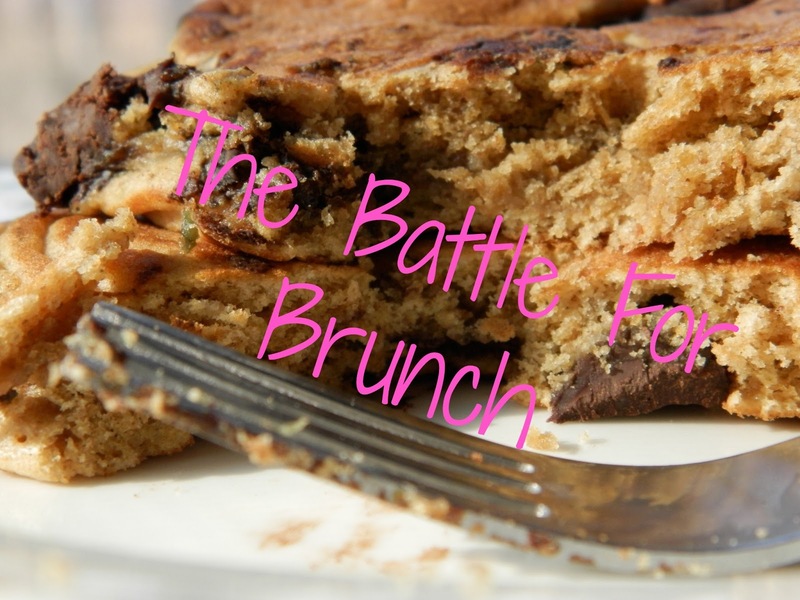 She compared the results and came to a crushing conclusion: the waffle batter was really pancake batter! She was crushed that her waffles would not work, but she overcame her setbacks and considered changing her waffle-brunch into a pancake-brunch. And that is exactly what she did, and it was a success, with pancakes and eggs and bacon, her family enjoyed themselves and were all filled with euphoria during their lovely brunch. The little girl was satisfied with her pancake sand vowed to find a better waffle recipe and remembered the good thing that came out of the debacle- they would be getting a new waffle maker. I hope you enjoyed my story. Remember: this work was entirely fiction and any similarities of characters to people living or dead is simply coincidental. 1. Preheat oven to 250 degrees Fahrenheit and put a pan with foil in it. You'll be putting the pancakes there to keep them warm until all the others are done. 2. Whisk together the flour, sugar, baking powder, baking soda, and salt in a medium bowl. In your blender combine the melted butter and peanut butter, and blend until smooth. Add the buttermilk and eggs and blend to combine. Pour the wet ingredients from the blender over the dry ingredients and stir just until incorporated. 3. 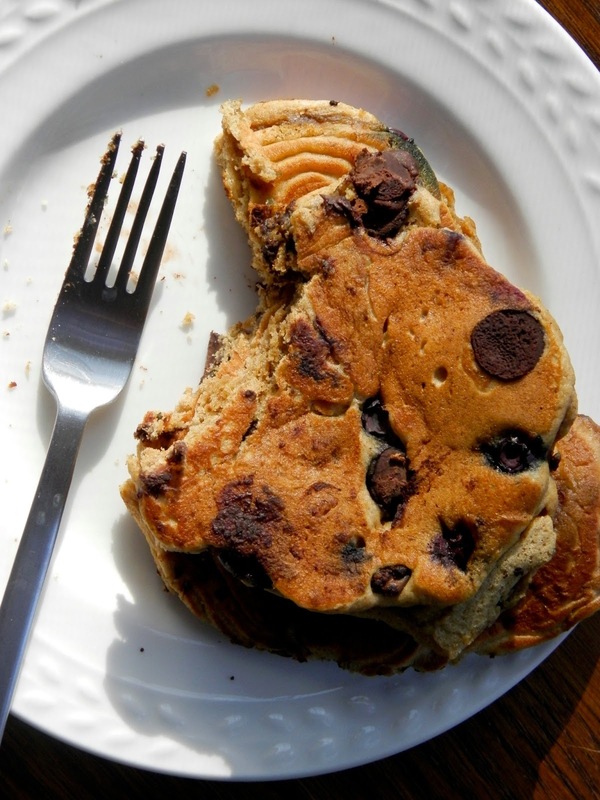 Scoop 1/4 pancakes into the pan and sprinkle with how many blueberries and chocolate chips or any other add-ins you would like. Flip after about 2 minutes. Cook evenly on both sides. 4. When done, move the pancakes onto the pan in the oven until ready to serve.